The last couple of weeks - especially with MWC - have seen lots of noise around embedded SIMs (eSIMs). In particular, the GSMA announced its remote provisioning standard (link). While interesting and a step in the right direction, I think the industry is over-hyping the potential of eSIMs. eSIMs are still physical SIMs, but they are built-into devices as fixed hardware components (basically an extra chip soldered-in), rather than as traditional removable cards. They can be remotely-programmed to support different operators' profiles, or switch between them. In that sense, eSIM is definitely a step forward. More use-cases become practical for cellular connectivity, just at the time when M2M/IoT is finally taking off. However, it would be wrong to assume this means that 4G-connected consumer devices will become the norm. While some categories (eg cars) are widely adopting cellular radios, others (eg wearables, home electrical appliances) are not. A 4G radio module and a SIM/eSIM remains a significant extra component on the per-unit BoM (bill of materials) cost for a manufacturer, plus the costs of extra design, engineering and testing in creating a cellular version of a product, amortised over the volume sold. Today, normal 4G modules for devices cost perhaps $20-30, with SIM, battery & other components added to that. New versions of LTE are being designed to reduce costs, by cutting down some of the functions of "full" LTE. The target price for a new Cat-1 LTE module, optimised for M2M, is about $15. It's reasonable to imagine that Cat-1 (or Cat-M, its successor) will get to the $10 range over the next couple of years. In parallel to this, when the new 3GPP NB-IoT low-power standard starts to ship (maybe mid-late 2017, being optimistic) the price should be more like $5-10, with an intention (I'm guessing 2018) to get that below $5. Add on an extra amount for the eSIM licence and design/test costs - probably a few dollars more. Then add on whatever is needed in terms of extra battery, software and so forth. In other words even in two years' time, adding cellular to a consumer device will still cost the manufacturer at least $10 and perhaps $20 depending on the power/transmit speed needed, number of frequency bands, fallback to 3G, voice support and so on. While that's better than today, it's still significant for a manufacturer to wear. Now $10 does not seem like much - or even $30 - until you consider the underlying costs of the devices they're supposed to be built into. So in other words, adding a cellular module now, and also in the mid-term future, is a large % of gross margin for most consumer devices, irrespective of whether it uses SIM or eSIM. Nobody is going to add a $10 extra cost to a toaster which has only a $5 margin, unless they can charge an extra $10 (or preferably $20) for it. And if only perhaps 10% of people actually (a) care enough to want a connected toaster, and (b) are willing to pay the extra cash upfront, then the product will become uncompetitive. Instead, the manufacturer could make two versions - normal & connected - sold at different prices. But that adds complexity in manufacturing, adds inventory costs, and there's no guarantee that retailers will stock both anyway. There's also no realistic way for cellular operators to subsidise the new mToasters down to the normal price, unless they sell them in their own stores, or find a way to reward the manufacturers with a sign-up bounty or rev-share once they get activated. Result - the cellular Connected Toaster market is a non-starter, unless someone works out a way to print adverts on toast in shades of brown, and creates a new business model. And even then, you could probably do it more cheaply and easily with a WiFi Toaster. Now obviously that's an extreme example - but it is designed to make the point that if (radio module+SIM) is a big % of the underlying device gross margin, and take-up rate is likely to be low, then the concept is not viable. In particular, if a device doesn't already come in (successful and well-used) WiFi-connected versions, it is unlikely to succeed in cellular variants, unless it has wheels or legs, plus high margin and a possible new revenue stream. A $2000 specialist mountain bike might get a cellular radio built-in. A $20 bike sold in a developing country will not. New categories of devices which need always-on wide area connectivity to function - eg "lost and found" tags or wearables for wayward pets and children, or realtime heart-rate monitors with emergency alert capability for cardiac patients (notwithstanding insurance liability costs). This also means that the vast bulk of upcoming IoT devices (the quasi-mythical 10bn, 20bn, 50bn figures) will not support cellular, certainly by 2020, and perhaps even by 2025, unless 5G module prices get below $1, which seems unlikely. The majority will either use WiFi, cheaper (& non-SIM) LPWAN technologies, or maybe aggregated locally via a cellular gateway. Cellular is definitely a player in IoT, but it will certainly not be ubiquitous, eSIM or not. There needs to be a specific reason and use-case for its inclusion - it is too expensive to be added in by a manufacturer just as an extra feature, except on very expensive/profitable products. Disruptive Analysis has conducted research projects & internal advisory workshops on SIMs/eSIMs for tier-1 mobile operators, vendors and investors in the recent past, as well as writing about the Apple and Google SIMs. In addition, I've written about IoT Networking & LPWAN technologies for STL Research, as part of its Future of the Network research stream. (details here) Please contact information AT disruptive-analysis DOT com for more details. Three has announced a deal (link) with Shine that will (at a future date) implement network-level ad-blocking. The PR talks a good game about privacy and control, but is unfortunately divorced from reality in several important ways. Now to be fair, some mobile ads are very annoying and intrusive. I hate the ones that pop-up while scrolling through a website (or in-app) and take you straight to the appstore download page, as you swipe on the wrong bit of the screen. And yes, if I was limited to a very small data allowance, I'd be annoyed by the big chunks of data from the ads themselves, cookies and assorted other background marketing eating up my quota. There's a bunch of dodgy privacy-invading practices too, which I despise. 50-90% of smartphone use, and probably 90-95% of tablet use, is over WiFi - and almost exclusively WiFi not provided by cellular operators, or transiting their core networks. Therefore people will still get ads on their phones most of the time. (And no, they won't "onload" to cellular just for the ad-free experience). The most fast-growing part of mobile advertising is in-app. And while some in-app traffic (eg rendered in browser-style webview pages) might be blockable, the "native" ads such as Facebook's in-timeline ads won't be. Facebook blends them in at the server, and encrypts it all. That's not going to change, apart from becoming ever more-sophisticated. Any network-level solution is held hostage to future modifications in Android and iOS which offer work-around options for advertisers. That might not be a bad thing, in that it could cut down on some of the worse pop-up offenders or most-egregious "cookie monsters", but it won't reduce the overall amount of ads. The bottom line is that screaming headlines in stories like those from ZeroHedge (link) about "the risk to Internet companies' business models" are nonsense. Ironically, it's Google and Facebook's approach to advertising that is safe. Small online publications using other advertising channels may not be so lucky. I noticed this tweet referencing mobile advertising growth forecasts from Goldman Sachs (link) which seems to suggest that Wall St is sanguine about the adblocking "threat" and that rapid growth in revenues will continue. Yes, there are some possible upsides here. Network-level cookie blocking is a possibility, and could help preserve privacy. (I already use a VPN service from F-Secure that anonymises my traffic, on mobile and WiFi). We could also see a proportion of the nastiest pop-up ads being squashed, which is also a good thing in most users' eyes. But that will just shift mobile advertising to other inventory types or channels. And maybe for some very low-end users, in markets with low-end data plans and a preponderance of web vs. app traffic, it could make a worthwhile difference. But for everyone else, I think it's hugely overhyped. It's unlikely to stop more than single-digit % of overall data traffic per user. There's a huge set of "gotchas" for the idea that mobile network operators can make a meaningful difference, given WiFI and in-app ads. And the idea of actually charging advertisers for some sort of curated "personal advertising preference" system isn't going to come through this route either. (There's a whole separate post's worth of problems about that side of things, but it won't even get to that stage). Yes, it makes for fun controversial headlines and might allow telcos to stick another metaphorical finger up at net-neutrality rules ("See? We're protecting consumers by fiddling with traffic non-consensually!"). But it's a sideshow, not something that will give Google sleepless nights. Incidentally if you're reading this on a phone, here's a mobile advert: I do workshops, consulting projects and speaking engagements for operators, vendors and investors, on a variety of topics such as mobile networks, voice/video/UCaaS, and broader telecom futurism (link). I think of concepts like this, 5 years ahead, when they're stilll plausible. Drop me a line via information AT disruptive-analysis dot com, or via Twitter or LinkedIn. And good luck blocking this paragraph in the network without some really good AI and contextual analysis (I cover those technologies too). As widely hinted in recent months, GSMA has tried to re-animate the RCS corpse once more, this time with Google playing the role of Dr Frankenstein. "Operators have agreed to transition toward a common, universal profile based on the GSMA’s RCS specifications and an Android RCS client provided by Google"
It's belatedly throwing various independent RCS app providers under the bus, trying to make disparate RCS implementations actually work together. As with VoLTE, RCS has suffered a wide range of non-interoperable versions to date, which is rather embarrassing for an application that was mainly standardised for the purpose of interoperability, rather than user-utility. That it's failed to actually be interoperable, as well as failed to be useful & well-designed, is just another eaten brain in the 8-year zombie catastrophe of RCS. - No mention of messaging-as-a-platform, despite that being hinted at previously in RCS presentations I've seen. Given that WeChat, Facebook Messenger, WhatsApp and others are shifting to commerce/advertising "streams", that's a surprising omission. - No current usage numbers for RCS. There's vague pronouncements about "towards a billion users", but no baseline of current DAUs/MAUs for "proper" RCS usage, not just SMS-replacement texting. - It doesn't mention the new RCS client being made mandatory in future Android builds. It just says it's available. The PR is very operator-centric, which doesn't seem to suggest that all OEMs will automatically implement it in new devices, especially where they're sold through open-market channels. - No clear timelines or wholehearted commitment by Google "an important step forward in bringing a better messaging experience for Android users everywhere"
Notably, the seminar at MWC is entitled "the path to one billion users" (link). The fact that there's about 1.8bn Android devices already out there, plus 900m iOS devices, with both still growing, tellls you that there isn't even the ambition for "ubiquity" any more. Google is just going through the motions. And if it was honest with itself, GSMA would admit that it's also looking for a graceful exit too. Stop talking about "Digital Services". Take a broader view of "Telco Futurism"
The biggest cliché in telecoms is that operators need to become "digital service providers". All computing technology is digital, and has been for decades. Morse Code (invented in 1844) is digital. Pretty much all business processes already use digital technology too, albeit perhaps in disjointed fashion. It's equivalent to talking about services enabled by electricity - technically true, but irrelevant and unhelpful. Meanwhile plenty of analogue phenomena, products and skills remain valued and cherished by consumers and businesses. The field of "design thinking" is a good example of the value analogue ideas still bring to enterprise. Future bio-computers may be analogue. Yet this vague, catch-all "something must be done" digital mantra is pervasive. It's used as a comfort-blanket for those doubting their own continued relevance, often devoid of understanding of what is happening in the world at large. Expect "digital" to be writ large at MWC in Barcelona next week. If you're there, question its inclusion and meaning vigorously at every opportunity. Ask vendors and operators how many designers they employ, and if they have a CDO as well as a CTO. Instead of picking a historical and irrelevant technology-related term, the industry needs to acknowledge and embrace a far more important one: "Future". Rather than digital services, telcos should instead start talking about Future Services with the underlying mindset of Telco Futurism. This means reframing the debate, to one where Networks and Communications intersect with multiple emerging Future trends - analogue OR digital OR non-computing - to create new experiences, new capabilities, new threats and new sources of value. Those trends indeed could be technological (eg machine-learning, or robotics), or they could be social, behavioural, biological or political (eg urbanisation or biomedical advances). They may yield new services, new operational practices, new competitors, new governance systems or new supporting infrastructure. As I've noted before [link], the words and analogies we choose are vitally important. If we describe ideas or strategies fuzzily, using woolly comparisons or try to knit many unconnected strands into a single blanket theme, we start acting like sheep, not wolves. (Yes, the puns are deliberate. The word "digital" is shorn of meaning. I'll leave "lambs to the slaughter" as an exercise for the reader, to shepherd into the fold). Focusing on "digital" is a distraction. The industry needs to be "post-digital", where obviously computing and communications is pervasive, but that's taken for granted. What's important for telecoms is what else is happening, and how it reacts dynamically to a changing, accelerating world. I’m personally very interested in the overall long-term futures path: IoT, robotics, human enhancement, socio-political change, sharing/gig economies, blockchain, 3D-printing, new energy sources and much more. But from a business and consulting standpoint, I’m looking at how those changes specifically impact the telecoms industry, its customers and its vendors, primarily on a 3-5 year view. In the past, the futures/analysis horizon was 5-10 or even 20 years away. "Scenario planning", "Foresight" and similar terms are used to describe the distant pathways that may lie ahead. In most cases, only a few strategists and the CEO had to consider the far, scary sci-fi future - other people in the organisation only had to consider a fairly limited envelope, within which change and competition could occur. But that threshold has massively compressed recently. Unimaginable change from outside classic telecoms now impacts within a 3-5 year horizon, quite possibly reducing to 1-2 years soon. Product management, marketing and finance functions cannot just complacently focus on the "known knowns". This means that analysts - and telco strategists and executives - now need to consider the impact of much bigger "out of context" trends than they perhaps feel comfortable with, or else just confine themselves to commenting upon and forecasting narrow product niches, and hope to be insulated from the medium-to-longer term chaos. 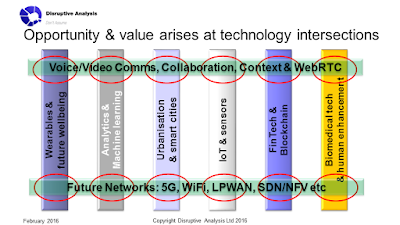 Critically, some of the most important changes in telecoms - NFV/SDN, 5G networks, LPWAN, "IP transformation" and so on, are occurring at the same time as accelerating non-telecom megatrends elsewhere. Assuming those paths are independent is naive. We see hints of this in the discussion of IoT and telecoms, but that tends to assume a shallow overlap on a Venn diagram, not something more fundamental and under-lying. Most telcos don't understand the future. And most futurists misunderstand telecoms. I see too many trite slogans that "everything will be mobile", that there's a "traffic tsunami", or that voice communication is "dead", or that telcos only choices are between "battling OTTs", "offering digital services" or becoming "dumb pipes". There's a lot of regurgitation of old, discredited or skewed vendor marketing hype ("1000x"). There is little understanding of what else is changing in the world, and how it affects telecoms, directly or indirectly. We have already seen what happens when external, misunderstood trends (eg the web) intersect with telecoms on a 10-year view. Those megatrends are now occurring 3x faster - look at the pace of development of drones, machine-learning, self-driving cars, or CRiSPR genetic engineering as examples. The next megatrends will be faster still. Communications technology trends intersect with other trends, with unpredictable and even chaotic implications. We've seen this in the past, where broadband networks' evolution intersected with the web (a way of storing/linking information), audio codecs (enabling VoIP), or capacitative multi-touch displays (driving modern smartphone UIs). Opportunities: The main focus of this post and much of my work, is where new service possibilities arise at the intersection of two or more trends, such as (mobile broadband + wearables), or (voice communications + machine learning). Risks: Potential negative impacts to historic business models, incumbency or operations arising from new trends or technology. The rise of encryption, preventing network discrimination or "optimisation" of applications, is a good example. Redefinitions: A shift of perspective for a long-used word or idea, driven by an emerging trend. My recent post (link) on voice vs. telephony is an example. Game-changers: Also known as a disruption, this is a fundamental change in the human, societal, technological or economic background which can destroy an old industry, or create a new one. The Internet is an obvious one. Some of these non-telecom future trends include urbanisation of society (which drives smart cities and many other effects), the rise of machine-learning and AI, evolution of robots & smart machines, 3D-printing, biomedical advances driving longer lifespans, human enhancements in body & cognition, a reinvention of transactions, new types of crime and terrorism, shifts in transportation and energy, and many other huge evolutions of society and business. These non-telecoms developments will all change why, when, where, how and with whom we communicate, and the networks we use to do so. Yet for the most part, the industry fails to grasp the subtleties implied. There are similar limitations in understanding how communications will change in enterprises, as well as telcos. While there's a lot of talk about "collaboration", or vague pronouncements about "digital transformation", there's still a huge gulf in understanding and knowledge of how these are likely to play out, given the various other trends which are now "baked into" technology, business and society. Businesses' future employees, associates and customers will experience and consume communications capabilities and services in entirely new ways. This is driven not just by networks moving to IP, or normal business evolution and the latest management/process trends, but also what changes in other adjacent technology areas - for example, AI and machine learning, or drones or ubiquitous sensors. So what are these communications/megatrend intersections? 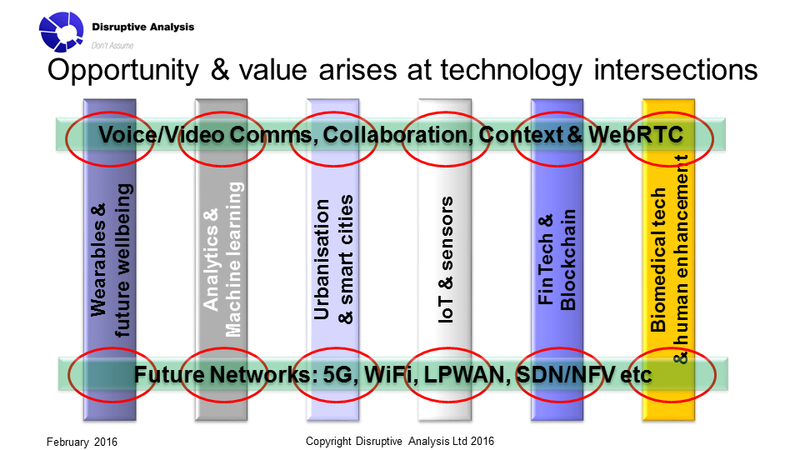 Let’s take two main “communications” themes as horizontals – better networks (5G, LPWAN, WiFi, NFV/SDN), and better “conversations” (ie voice/video/messaging apps and platforms). And then consider how they touch important “vertical” trends – for example, technologies such as cognitive computing, IoT/sensors, wearables – or socioeconomic changes such as exponentially-growing sharing-economy businesses, or crowd-sourcing. Contextual communications, occurring at the intersection of machine-learning, sensors and new UC and WebRTC platforms/APIs. Smart crowd-control, using behavioural analytics, architectural design tools, fluid-dynamics modelling and mobile devices/networks for measurement/information. Insurance claim-management, using a combination of voice analytics, video-streaming (eg walking around a vehicle) and perhaps in future self-driving recovery vehicles or 3D-printers for parts. The almost-cliched example of Uber is a good one. As well as its full-time employees, it also has a vast network of drivers who are independent agents/contractors. These communicate with the end customers, with location, payment, reputation and mobility all intertwined with the basic ingredients of messaging, voice and notification. We already talk about the "Uberisation of Everything", but we miss that communication is at the core of the sharing and gig economies. All of these present both opportunities and challenges for traditional telcos or enterprise communications/network vendors. Communications is starting to get absorbed into apps, websites or devices. Networks are being optimised to serve particular purposes. There is less need – and less value – placed on one-size-fits-all standardised offerings like phone calls. Value is flowing to ideation and design, as it increasingly becomes possible to make anything “real” once it is conceived. The risk is that conventional telecom or enterprise solution vendors spend so long trying to fit historic constructs and processes to this new work (eg IMS) that they miss the opportunities. There is an equal risk that regulators and governments restrict the telecom market to historic products like "phone calls", and create new rules for "digital services" that end up creating unintended consequences that impede innovation and dynamism. The future of telecom isn't in Barcelona this week. It's at conferences on drones, urban-planning, blockchain, future food, virtual assistants and many others. Yes, there will be car-makers and assorted IoT gizmos at MWC, but expecting the rest of the world to come to telecoms, rather than vice-versa, is arrogant and narrow-minded. Real disruption occurs at intersections between technology paths, not because of steady - or even accelerating - evolution along those paths. 5G will not be a big deal in its own right, for example – it is only brought to life when it encounters new devices, new philosophies, new business models. The same is true of new cloud-collaboration and UCaaS platforms for enterprise communications. The word "digital" is meaningless, misleading and distracting. It is technology-centric "virtue-signalling" for lazy telco execs and ignorant politicians, used to describe anything from home automation, to music downloads, to industrial IoT platforms, to providing footfall statistics for retailers. This is also why I've started my own re-focusing and re-branding. Historically, I've described myself as a technology analyst & strategy consultant. My remit spans mobile, voice/video communications, regulatory policy, telco business models, enterprise UC/UCaaS and so on. That's already wider than most of my peers in the analyst world, who generally focus on specific slices of the industry, which they cover in more depth. However, this has changed in recent months. I have started to focus more on longer-term trends in technology and society, with an even broader perspective, well beyond just telecoms/Internet, as they all inter-relate. I'm now working not just as an analyst - and more specifically, a "Telco Futurist". What this means is that you should expect a lot more "tangential-seeming" material from me. While I'm still going to be covering NFV, WiFi, 5G, WebRTC, UC/UCaaS and related areas, I'm also going to be talking about drones, self-driving vehicles, machine-learning and other topics. They're not far off. They're not sci-fi. They're not niche. They're pivotal to the future of the telecom/Internet-comms industry, and understanding their intersections with networking and voice/video technologies is essential.